On February 8, Matt Evans’ geography students were able to use an item made in our own design and fabrication lab as a valuable tool in their learning. 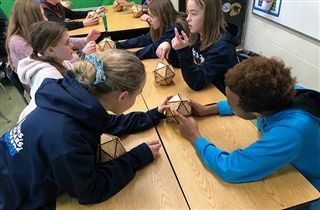 Using dymaxion globes that they created with Tim Rice in the design and fabrication lab, students were able to view and learn about the geography of our world in a new way. Using a games approach with the globes, students had fun while learning about the Earth!